is to be an inspiration." The price of success is time. - NOT money. the League of Extraordinary Gentlemen." 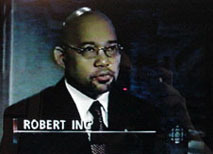 Robert Ing, DSc, FAPSc, FInstMP(UK) is a Canadian forensic scientist, mentalist, author, media spokesperson and adventurer. As a forensic specialist he has, and continues to make frequent appearances on major television news and talk networks on issues of national security, espionage risk management, privacy issues, identity theft, electronic surveillance and technology crime. A recognized authority on technical security and investigation, Dr. Ing has given workshops and lectured extensively on forensic intelligence issues under the auspices of the federal governments of the United States and Canada. 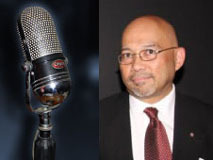 An advocate for science literacy and awareness, he has been the host of several documentaries for public broadcast. As a mentalist he performs interactive mind reading and paranormal demonstrations on stage for live audiences. In this role he is best known for his theatrical performances of nail gun roulette and a 19th century inspired bullet catch. He is a Fellow of the Academy of Police Science and a Fellow of the Institute of Meridian Psychotherapy. A respected and multi-disciplined professional, he has been the recipient of many awards such as the Kaufman Humanitarian Award, Emergency Services Medal, the Norris R. Browne Memorial Award, the Warrior's Medal, the Venerable Order of the Knights of Michael the Archangel, and the Sovereign's Medal to name a few. "Robert is an excellent communicator who has helped us numerous times to unfold stories that pertain to concerns about Internet sleuthing, privacy and threats to privacy." Dr Robert Ing discusses the obvious and not so obvious reasons why people don't get the job they apply for. 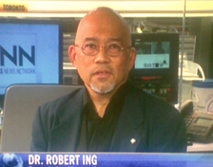 Dr. Robert Ing discusses the issue of minimum wage and offers a modified alternative. Dr. Robert Ing solves the Rubik's Cube triple blindfolded with one being a solid galvanized steel bucket - helmet. Dr Robert Ing aka The Paranormalist performs a one man, 19th century inspired bullet catch. Do NOT try this as death or critical injury may result.